Sunday, February 24, Sacred Stream will present a very special concert in San Francisco with Windham Hill and Sony recording artist Lisa Lynne, and composer and multi-instrumentalist Aryeh Frankfurter. These two remarkable artists captivate audiences with masterful performances, humorous stories, music from Sweden and Ireland, and original works. Together, they have sold over a million albums and have performed with many of the biggest names in folk and acoustic music. 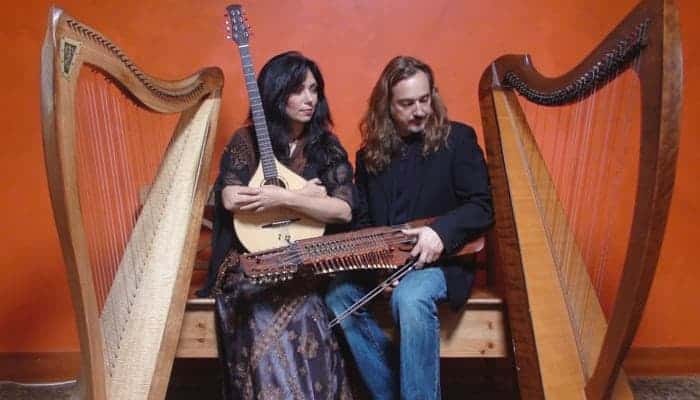 They play a unique array of instruments, including the Celtic harp, Swedish nyckelharpa, Ukrainian bandura, and cittern. This promises to be an enchanting night of music and mastery you won’t want to miss! Lisa Lynne is a multi-instrumentalist and performer who has gained worldwide recognition for her original music featuring the Celtic harp. She is widely acclaimed for composing memorable and heartwarming melodies on the Windham Hill and Sony music labels. Lisa tours year-round performing at world-class US festivals and performing arts centers. Her work in therapeutic music and “Hands-on-Harps” programs have gained national recognition on NBC, CNN, Fox News Atlanta, and the Wall Street Journal, to name a few. Lisa’s music appears on the award winning PBS special “Alone in the Wilderness,” and has been featured on commercial television and independent films. Los Angeles Magazine recently named Lisa one of the 50 most inspiring women. She performs regularly as a solo artist, and with Aryeh Frankfurter, Patrick Ball, and the Windham Hill tours. For more information, visit lisalynne.com. Aryeh Frankfurter is a renowned Celtic harper and world-traveling multi-instrumentalist who went from virtuosic progressive rock violin to intricate Swedish folk and Celtic music. He began with classical violin at the age of three. His early studies and successes led him to explore various ethnic and international musical genres. Aryeh has performed for Prince Charles and at many of the world’s top international music festivals. He has 17 albums to his credit, composes for film and television, and continues to teach himself to play a variety of instruments, most recently the rarely seen Swedish Nyckelharpa. Learn more about his critically acclaimed work at lionharp.com. The concert will be held at a private residence in San Francisco at 7:00 pm (doors open at 6:45 pm). Admission is $30 ($25 before February 10). To reserve your seat, register online, call (415) 333-1434, or email info@sacredstream.org.